For the works Banafsh, Persian Alphabet on Grid Pattern, and Green Alphabet (all in the NYU Art Collection), Bijan Dowlatshahi switched from acrylic on canvas to a less restrained media—dyed canvases that he left unstretched and hung unframed on the wall. With its multiple instances of the Persian equivalent to the single digit “1” in the background, Banafsh continues Dowlatshahi’s interest in numbers. 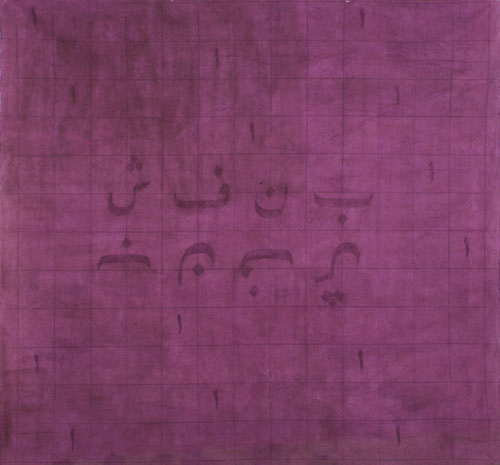 The central text is the word “violet,” and the work’s title, Banafsh, is the transliterated version of the Persian word. The characters read from right to left in the top line; the bottom line is the entire word turned upside down. Dimensions 73 x 79 in.